Our local guild brought in Cindy Needham for a lecture and classes, and I was so glad to take her Heirloom Feathers class. It was almost snowed out, though. We got a historic amount of snow and freezing rain on Wednesday and early Thursday. Many flights were cancelled, all schools were shut down, and most everyone was stuck in their homes with 5" to 14" of snow! Our guild meeting (Thursday night) got cancelled, so we didn't get to have the lecture at all. But Cindy was a trooper and got into the airport. And the Friday and Saturday classes were still held. As a special treat to those of us who took her classes, she held a trunk show for the first hour with some of the quilts she was going to show us at the guild meeting. Thank you Cindy! 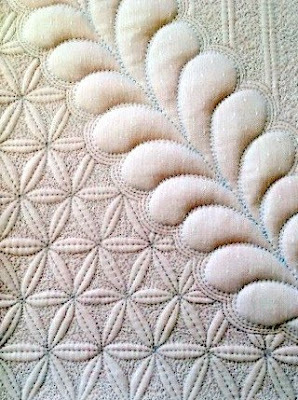 I have done machine quilting for a long time, and since I have a wonderful sit down long arm now, going back to my sewing machine seemed odd. The motions on the sewing machine, however, are the same as the sit down. And it is always helpful to get hints and tips from as many teachers as you can, and students sitting next to you. Cindy was extremely generous with her threads and templates and she showed us a lot of different ways to design and draw feathers, and gave us lots of tips about thread, needles, heirloom soaking products, and batting. She readily shares on Pinterest, so if you want to see some of her work, and some of her students' work, check it out. I hope you have the opportunity to take classes from National teachers too! I enjoyed taking a class from Cindy a number of years ago. I found her to be so motivating and her description of how to do a fill stitch was so understandable for me that I could achieve it with a little practice! I appreciated her design sense too. How fortunate you were there in spite of the ice and snow!